The anniversary event took place at Glyndyfrdwy Station which lies on the Llangollen to Corwen railway, running along the River Dee. 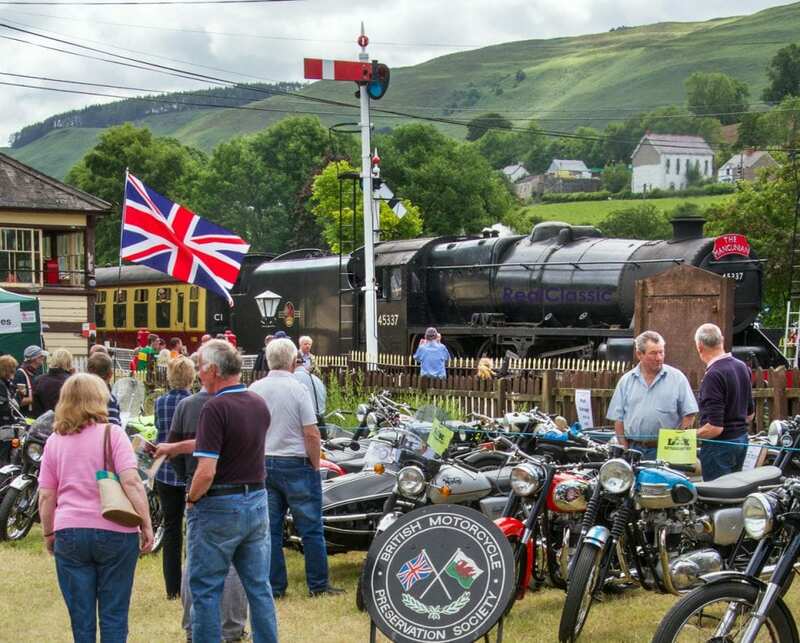 The anniversary was part of the Llangollen Railway Classic Transport Weekend so not only were there motorcycles on display but also classic cars, buses, fire engines and even the occasional steam train. All this took place in glorious sunshine which, as we all know, always shines on the righteous. Ixion was a marque of three parts, the first running from 1902 to 1904 at the Primus Motor Works in London where a 1hp two-stroke engine was attached to a bicycle and drove it by friction. The following year saw a ‘proper’ motorcycle with a 1½hp engine and in 1904 the 3hp version arrived, albeit still mounted in what was ostensibly a bicycle frame. The name disappeared until 1910 when Ixion, now in Birmingham, emerged with 2½hp JAP and 3½hp Precision powered machines with belt drive and spring forks. 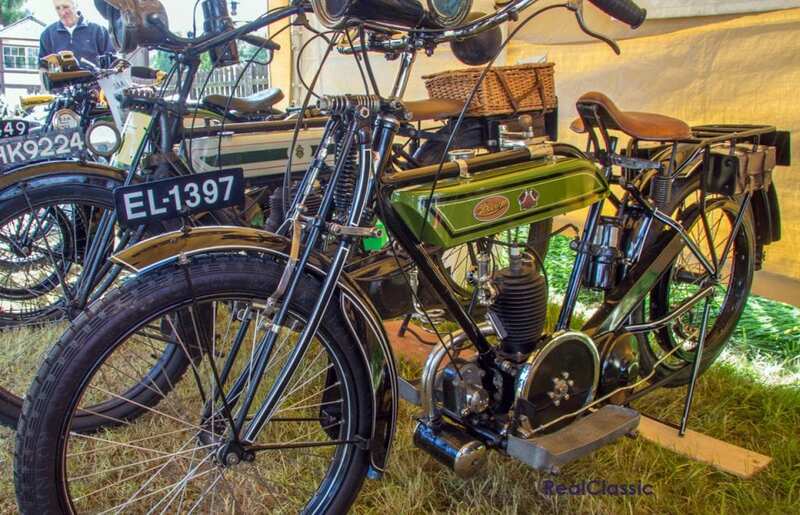 Larger and more sophisticated machines appeared together with a 269cc Villiers model with two speeds and Druid forks. After WW1 Ixion moved to Smethwick, Staffs, but only to produce the Villiers machine and production ceased in 1923. The final curtain went up and came down in 1930 when New Hudson, failing to sell a batch of 249cc side-valve machines, re-badged them as Ixion and then heavily discounted to get rid of the stock. This one dates from 1920 and so features the Villiers two-stroke engine. In 1928 Graham Walker won the Ulster Grand Prix on a Rudge, and the following year the firm produced its now famous Ulster model which featured a 498cc engine with bronze head and four valves, producing some 40bhp and capable of reaching the magic ton. Rudge Whitworth was an amalgamation of several bicycle firms and began building motorcycle in 1910 but by 1937 they had gone into liquidation and were bought by EMI who closed the concern down in 1940, two years after this example was built. 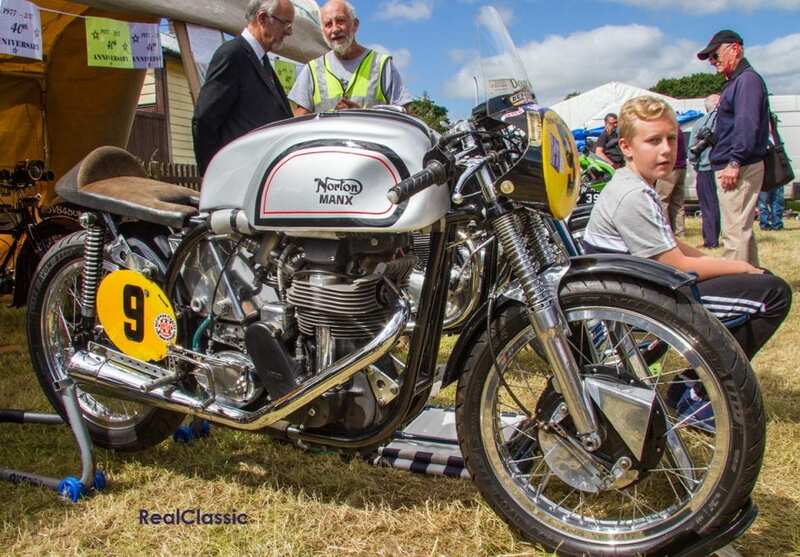 AJS (and Matchless) heavyweight twins are robustly reliable classics which, like their Norton counterparts, were available in 500, 600 and then 650cc variants. 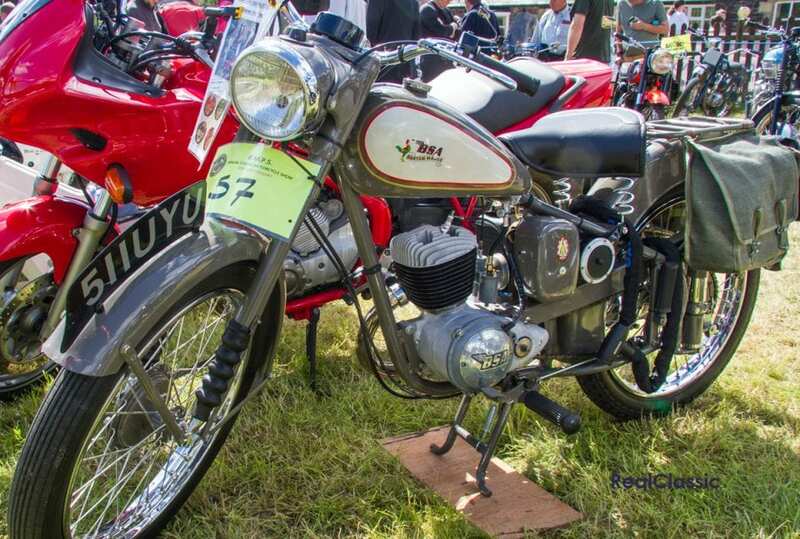 This Ajay is identified as a 600, making it a Model 30, the equivalent to its Matchless G11 stablemate. The ohv twin was good for 90mph and 60mpg and was produced from 1955 for four years until the 650 took over. This one was first registered in 1959, but uses some components from earlier machines. 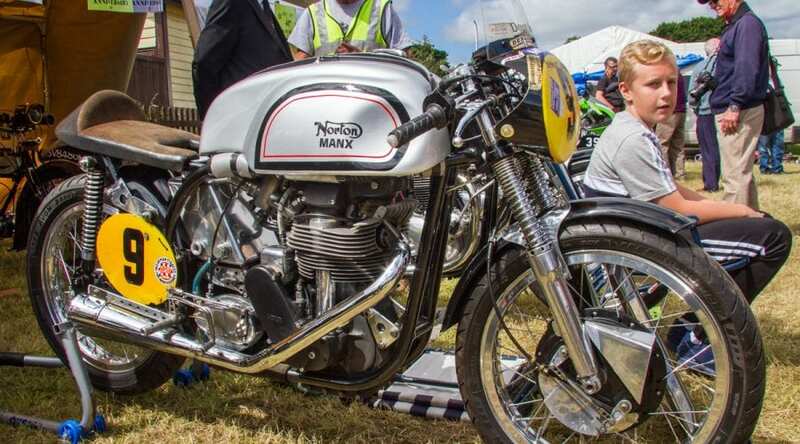 This overhead cam, 1960 Norton Manx 30M has had quite a life with seven Manx Grand Prix under its belt; it was five times Champion of Champions and a Gold Cup winner too. 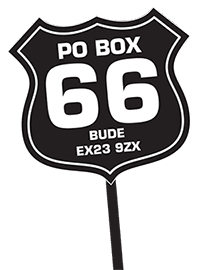 It’s been raced by Doug Jones and Stuart Tonge and ridden by Dave Aldana and Stan Woods, possibly at the Goodwood Revival where it’s appeared four times. 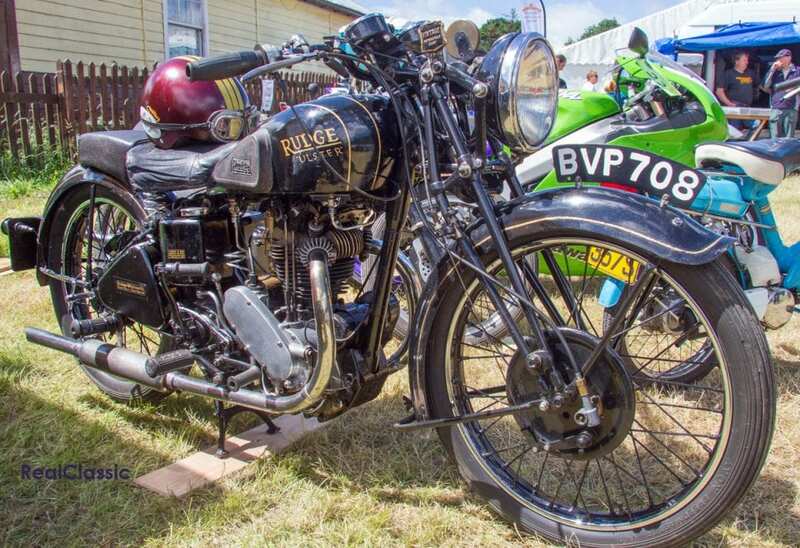 Given that BSA built approximately 200,000 Bantams between 1948 and 1971 you don’t see a huge number at shows, despite Roy Bacon’s advice that ‘the Bantam is an excellent way of owning a BSA at a reasonable cost, and any restoration needed should be quite easy to carry out’. This is Fred Myles’ 1955 150cc Bantam Major, part of the D3 series, which came with plunger rear suspension as standard (swinging arm after 1956) and Wipac electrics. It could reach 50mph when new; perfect for gentle classic rides today. 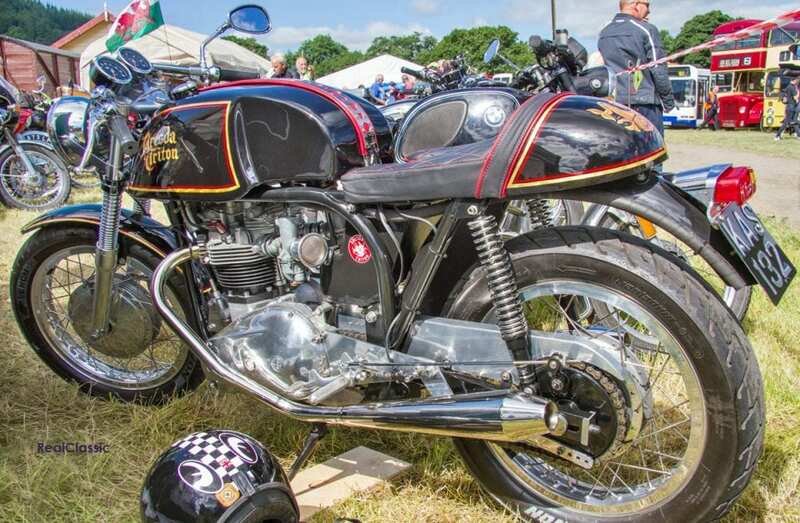 The owner of this Dresda Triton was distraught when I spoke to him – he had only just finished his restoration and, on the ride over, the stainless clip securing the tank strap had disappeared, allowing the strap to slide and craze the newly finished paintwork. 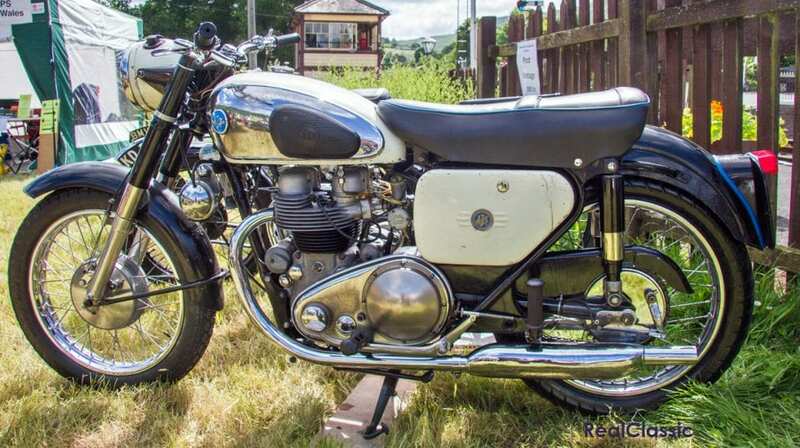 Still, with its Norton featherbed frame and five-speed Triumph 750 engine, donated by a T140V, it looked magnificent glinting in the sunshine. Although the BMPS’ focus is on UK machines there were other nations’ offerings at the show. This 1970 750cc Chang Jiang CJ750 outfit had come a long way from China to be in the Dee Valley. 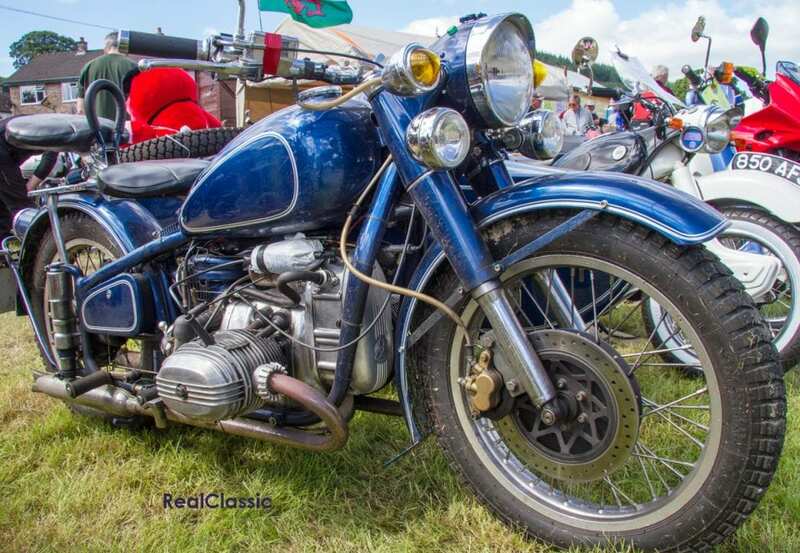 Its design can be traced back to a pre-war sidevalve BMW air-cooled opposed twin, which was first emulated by the Soviets to produce the Dnepr M72 for the Red Army. That bike then became the basis for a Chinese version, the Chang Jiang – meaning ‘Yangtze’, of course. 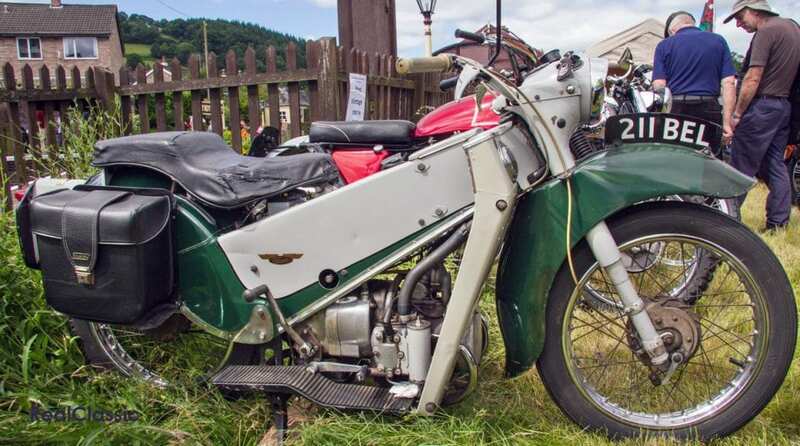 This 1961 Velocette LE had caused something of a traffic jam coming down a busy A5 on its way to the show but into every life a little rain must fall. The owner told me of a Venom that he still owned and had ‘Thruxtonised’ back in the day for racing. Despairing of finding a steel pinion to replace the standard fibre item in the magneto, he had approached Percy Goodman at the London Motorcycle Show. Mr Goodman asked to be given a week and the owner was to then write to his spares supplier with his enquiry; surprise, surprise – the steel pinion had been made available. You have to wonder if such service is provided today by major manufacturers.